AFC Fylde boss Dave Challinor is hoping to extend the loan deals of three key youngsters over the coming days. Both Jonny Smith and Luke Burke, on loan from Bristol City and Wigan Athletic respectively, see their deals expire next month, while defender George Edmundson is due to return to Oldham Athletic next Monday. 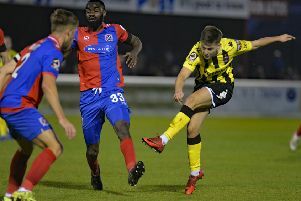 However, Challinor keen to keep hold of the trio and is in discussions with their parent clubs as the Coasters head into the second half of their debut National League campaign. Challinor said: “Jonny and Luke’s deals are due to expire at the end of January, so they still have a month remaining. We are speaking with both clubs at the moment and hopefully we can get something sorted because they have been very important for us. “Jonny has great ability and has been a real threat. He created some good opportunities at Tranmere on Boxing Day and got his goal, so we would love him to stay. “George’s situation is different because his loan is up after the Tranmere game on New Year’s Day. He is another we are keen to extend, but if things don’t materialise over the next few days we do have other options. Challinor’s side travel to Maidenhead United on Saturday looking to get their season back on track after six games without a win, and the manager is desperate to exorcise some demons from the 4-1 home defeat against the south London outfit at the start of the season. “We were down to ten men inside 10 minutes, so it was always going to be an uphill challenge.